Real Madrid have reportedly reached a decision on Gareth Bale and will look to axe him from Zinedine Zidane’s squad this summer. The 29-year-old has been with Los Blancos since 2013, scoring 102 goals in 224 appearances while winning a whole host of major honours including a La Liga title and four Champions League trophies. However, from making over 40 appearances in his first two campaigns with Real Madrid, Bale has seen injuries and poor form ensure his playing time has dropped, and his influence at the Bernabeu even without Cristiano Ronaldo has fallen. 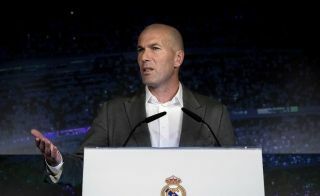 With Zinedine Zidane returning to the club earlier this month, coupled with the fact that they look set to end the season empty-handed, big changes are expected in the Spanish capital this summer and Bale could seemingly be used as a means to fund their transfer activity. According to AS, it’s reported that Real Madrid have now decided that they will sell Bale this summer, and that money will then go towards adding a new marquee name to the squad. Given the potential fee and getting his wages off the bill, coupled with the void that his exit would leave behind in the final third, that should arguably give Madrid a sizeable transfer kitty to go out and sign a world-class player. Having failed to adequately replace Ronaldo after his exit last summer, that is undoubtedly an area in which they must improve if Bale leaves too, and so Zidane will surely push for a new addition there. Meanwhile, AS adds that Manchester United and Bayern Munich have been two interested parties in the past, but it remains to be seen if either can satisfy Real Madrid’s demands, and in turn offer Bale the fresh opportunity that he could crave.